A letter of correspondence concerning the formal dedication of the new Downtown Orlando Post Office building, located at 51 East Jefferson Street in Downtown Orlando, Florida. The ceremony was sponsored by the Greater Orlando Chamber of Commerce. The letter is from J. D. Beggs, acting postmaster, to another postmaster concerning his attendance. The ceremony took place on April 15, 1941. Beggs sought to make the ceremony grand, and many prominent guests were there including then U.S. Senator Charles O. Andrews (1877-1946). 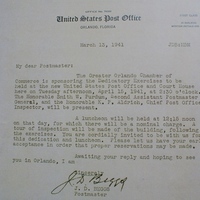 Original typewritten letter from J. D. Beggs, March 13, 1941: Orlando Remembered Exhibit, Downtown Orlando Post Office, Downtown Orlando, Florida. Digital reproduction of original typewritten letter from J. D. Beggs, March 13, 1941. "Letter to U.S. Senator Andrews from Postmaster General J. D. Beggs." Orlando Memory. August 29, 2012. Accessed October 13, 2015. http://www.orlandomemory.info/memory/image/letter-us-senator-andrews-postmaster-general-j-d-beggs. Beggs, J. D.. “Letter from J. D. Beggs (March 13, 1941).” RICHES of Central Florida accessed April 19, 2019, https://richesmi.cah.ucf.edu/omeka/items/show/5595.